Conveniently Located in Historic Fishtown in North Philadelphia. Walk-ins Always Welcome! We’ve been making Fishtown look good since 1992. It is our goal to provide our customers a laid back atmosphere and reasonably priced, Quality haircuts. Straight Razor Shaving is a dying art, but here at Sulimay’s you don’t have to pay high art prices to get a close shave. Sulimay’s is a CASH ONLY establishment. Haircuts & Shaves, it’s all we do, so we do them right. 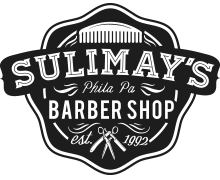 Sulimay’s was opened in 1992 as a comfortable neighborhood barber shop and 21 years later we are still offering the same friendly and reliable service. Our licensed barbers are well versed in providing the best haircuts and cleanest shaves in Philadelphia — Gracefully balancing efficiency and quality with each customer.